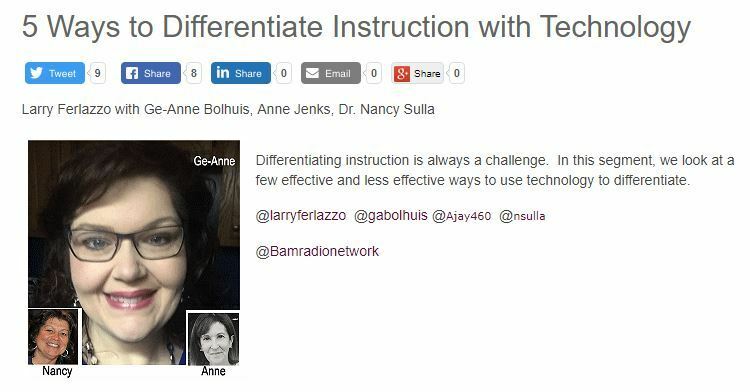 5 Ways to Differentiate Instruction with Technology is the topic of my latest ten-minute BAM! Radio Show. I’m joined by Ge-Anne Bolhuis, Anne Jenks, and Dr. Nancy Sulla, who have also all contributed written commentaries to my Education Week Teacher column. By the way, you can also now listen to the show on Google Play and Stitcher, in addition to iTunes.